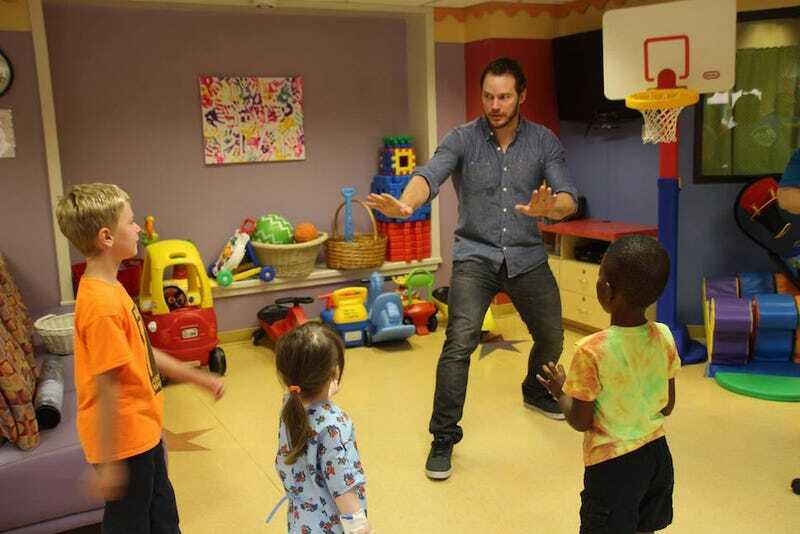 Much to the delight of tiny humans (and everyone else), star of Jurassic World and Hollywood Mensch Chris Pratt recently deployed his raptor-training skills at a children’s hospital. Pratt has already made something of a practice out of visiting his young and hospital-bound fans. Last March, he and Captain America star Chris Evans settled a Super Bowl bet by visiting both Seattle Children’s Hospital and Christopher’s Haven in Boston. Pratt also payed a visit to Dylan Prunty at Children’s Hospital Los Angeles last August so that the two could swap lines from The Lego Movie. Documentation of that cuteness is provided below. You’re welcome. Hollywood’s Cuddliest: right here, folks. Image via Imgur. Video Clip via YouTube.